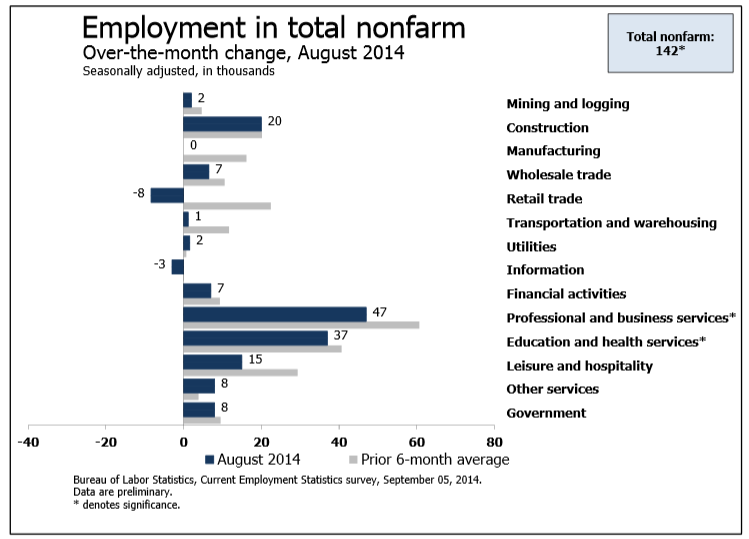 The payroll survey shows a net gain of 162,000 jobs vs. an expectation of 230,000 jobs. This broke a six-month string of +200,000 jobs. Digging into the details, things look far worse. The household survey shows a gain in employment of only 16,000. This is the fourth month in the last five that the household survey was substantially weaker than the headline number. The average employment gain in the past five months is 125,200 vs. an average gain in jobs over the same period of 230,800 per month. Is a trend forming? If so, it doesn't bode well. That said, the household survey is volatile and over time the data series merge. The question now is which one is right? At turns, the household survey tends to lead. The labor force fell by 64,000. 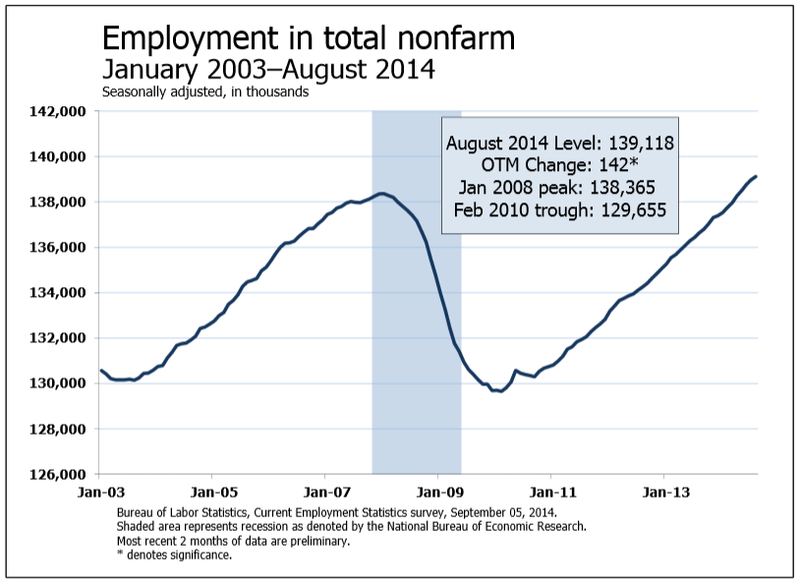 Those not in the labor force increased by 268,000. The unemployment rate fell by 0.1% thanks to a decline in the labor force greater than the rise in employment. In the past year the working-age population rose by 2,270,000. In the last year the labor force rose by 524,000. Please note that over the course of the last year, the working-age population rose by more than the number of people employed. 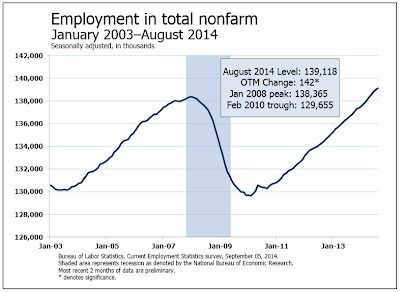 In normal times, the unemployment rate would have gone up slightly. Instead, the unemployment rate fell from 7.2% to 6.1%. Over 100% of the decline in unemployment in the past year is due to people dropping out of the labor force, rather than strength in the economy! 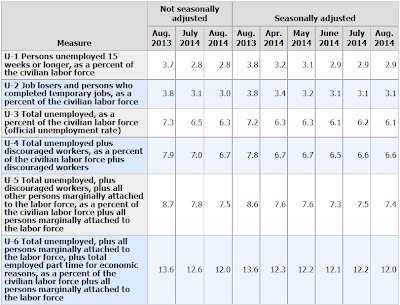 Please consider the Bureau of Labor Statistics (BLS) July 2014 Employment Report. Total nonfarm payroll employment increased by 142,000 in August, and the unemployment rate was little changed at 6.1 percent, the U.S. Bureau of Labor Statistics reported today. Job gains occurred in professional and business services and in health care. 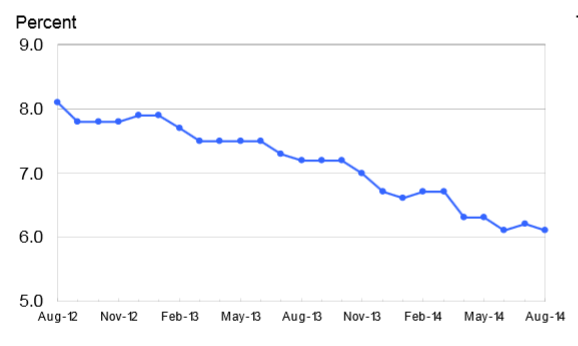 Average weekly hours of all private employees has been flat for six months at 34.5 hours. Average weekly hours of all private service-providing employees was flat at 33.3 hours. Average hourly earnings of private workers rose $0.06 to $20.68. Average hourly earnings of private service-providing employees rose $0.06 to $20.47. Starting January, I dropped the Birth/Death Model charts from this report. For those who follow the numbers, I keep this caution: Do not subtract the reported Birth-Death number from the reported headline number. That approach is statistically invalid. Should anything interesting arise in the Birth/Death numbers, I will add the charts back. 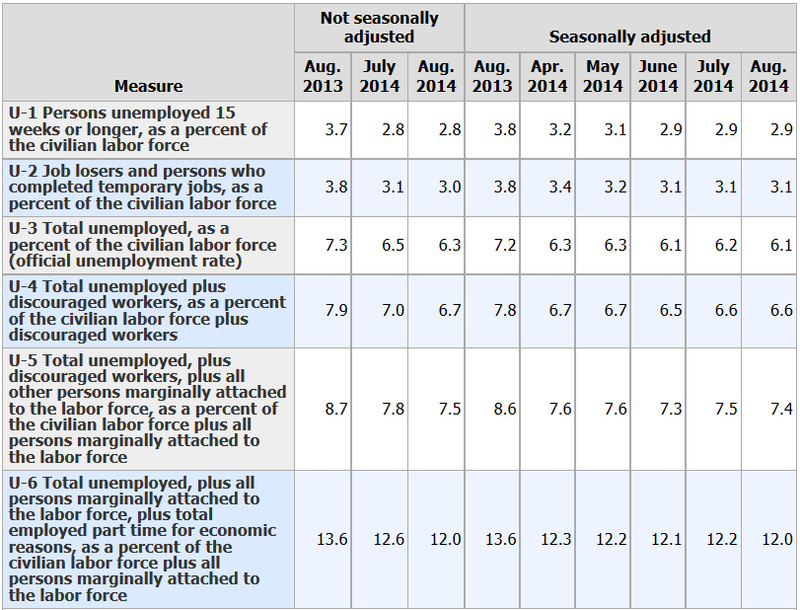 The official unemployment rate is 6.1%. However, if you start counting all the people who want a job but gave up, all the people with part-time jobs that want a full-time job, all the people who dropped off the unemployment rolls because their unemployment benefits ran out, etc., you get a closer picture of what the unemployment rate is. That number is in the last row labeled U-6. U-6 is much higher at 12.0%. Both numbers would be way higher still, were it not for millions dropping out of the labor force over the past few years. Were it not for people dropping out of the labor force over the past several years, the unemployment rate would be well over 9%. Some of those dropping out genuinely retired. However, millions retired involuntarily. That is, they needed to retire and collect social security because they had no job and no income. Such folks are no longer in the labor force even if they want a job. 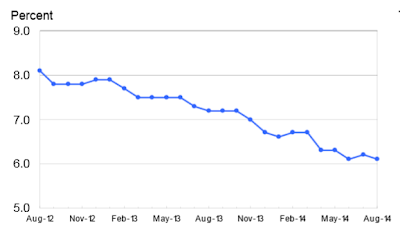 The falling unemployment rate is very deceiving, painting a picture of improvement that simply does not exist. A gallup survey on the economy better reflects how the average Joe feels: 38% Think Economy Getting Better, 56% Say Worse.